Another fun way to support ARIEL is just around the corner! The first ever ARIEL Sing-a-Thon will happen on Friday, March 29 from 5-8 pm at The Karen Wilson Children’s Theatre. With karaoke performances, group sing-a-longs, food, door prizes and more, this will be a fun family event for all ages. Tickets are just $5 and will be on sale at ARIEL beginning March 18. 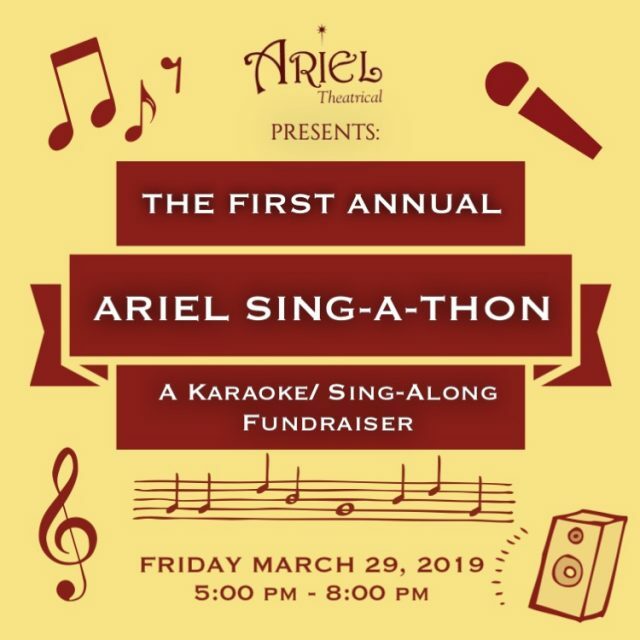 Karaoke songs are available to perform for a $300 donation (collecting pledges is encouraged) and business sponsors (donations of $150+) will be acknowledged in the event program and on custom ARIEL Sing-a-Thon t-shirts. Click on the links below for more information. We hope to see you there! ARIEL Theatrical presents The Wizard of Oz! “Follow the Yellow Brick Road” to ARIEL Theatrical for a classic musical that will take you and your family on an “Over the Rainbow” adventure! Featuring a cast of 65 young people, L. Frank Baum’s The Wizard of Oz will bring Dorothy, the Scarecrow, the Tinman, the Cowardly Lion, the Munchkins and other colorful characters to life as they bargain with the Wizard and contend with the menacing Wicked Witch of the West. Take a trip to Oz this summer at ARIEL Theatrical! The Wizard of Oz is generously sponsored by 1st Capital Bank; A&R Fresh; Hastie Financial Group; Noland, Hamerly, Etienne & Hoss; Prunedale Chevron; Silva Farms; Valley Exxon. Located in the heart of Salinas City Center, ARIEL Theatrical provides opportunities for children to explore the stage and learn valuable lessons about Accountability, Respect, Integrity, Excellence and Leadership – A-R-I-E-L. ARIEL’s finest productions are not the plays but the responsible young people who come together in a positive, collaborative spirit to learn, perform and share experiences that they will carry with them for a lifetime. ARIEL 2018 Season Sponsors include: Aladin Properties, Cardinale Moving and Storage and Central Coast Cleaning.